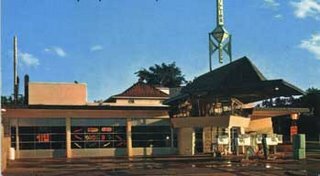 The Lindholm Service Station, designed in 1956 and built in 1958, is architecturally significant as the only gas station ever constructed from the designs of Frank Lloyd Wright. In 1958 it was placed on the National Register of Historic Places. The station combines glass, steel, cement, copper and wood in an adapted design from Wright¹s Broadacre City. Individual designs of cantilevered canopy, sky lights over service bays, glass walled observation lounge and towering pylon bring unique elements to this structure.